With all the exciting things going on at NewSouth Books — the release of Rheta Grimsley Johnson’s new memoir Enchanted Evening Barbie and the Second Coming, and great titles on the way like Wade Hall’s Interview with Abraham Lincoln, Ted Dunagan’s Secret of the Satilfa, and David Rigsbee’s The Red Tower: New and Selected Poems — we’ve barely had time to stop and celebrate the ten year mark. But as Publishers Weekly notes, evidence of this landmark can be seen in NewSouth’s increasing larger print runs and stronger submissions, and in events like NewSouth publishing the Alabama Big Read edition of The Adventures of Tom Sawyer in conjunction with the National Endowment of the Arts. Read the full article at the Publishers Weekly website. Not enough gets said about the good job many public libraries do in serving their communities with events programming. Alabama has quite a few that deserve recognition, many of which have hosted programs featuring NewSouth Books authors in the last few years. To name just a few who’ve partnered with us recently: the B.B. Comer Memorial Public Library in Sylacauga; the Ashland City Public Library; the Florence-Lauderdale Public Library; the Pell City Public Library; the Adelia McConnell Russell Library in Alex City; the Birmingham Public Library; the Selma-Dallas County Public Library; and the Mobile Public Library. On December 4, former Alabama governor John Patterson and historian Warren Trest discussed Nobody But the People, a biography offering new insights and rich details into the life of this significant Southern politician. The crowd of almost a hundred people greatly enjoyed meeting Gov. Patterson and hearing his personal story. Mr. Tidwell observed, “The presentations by Governor Patterson and Warren Trest fascinated our Lunch and Learn group. So much so that they kept them answering questions twenty minutes after the program was scheduled to end! This was indeed a rarity! We were well-pleased.” This must be true, because a reprise program featuring Governor Patterson and Warren Trest is being planned for March or April of next year. About his experiences, NewSouth author Warren Trest had this to say: “The Valley librarians were fantastic hosts — and top of the mark in every way.” We couldn’t agree more. The fruitful partnership between NewSouth and the Bradshaw Library will continue when Ted Dunagan speaks about his young adult novel A Yellow Watermelon on February 20, and when Rev. Robert Graetz discusses his memoir A White Preacher’s Message On Race and Reconciliation on February 27. These noontime programs will be highlights of the library’s Black History Month observation. In the Company of Owls, Nobody But the People, A Yellow Watermelon, and A White Preacher’s Message on Race and Reconciliation are available directly from NewSouth Books, or your favorite local or online book retailer. Starred reviews in Publishers Weekly and Library Journal for upcoming Fall 2008 titles do NewSouth Books proud. Publishers Weekly (August 18, 2008) featured The Yazoo Blues, a sequel to John Pritchard’s Junior Ray, one of Barnes & Noble’s Top Ten Sensational Debut Novels of 2005. Library Journal (August 15, 2008) featured The Wrong Side of Murder Creek by Bob Zellner with Constance Curry, a compelling memoir about Zellner’s role in the civil rights movement. In this insightful, laugh-out-loud follow-up to his debut novella, Junior Ray, Pritchard again indulges the profanely backwoods, occasionally backwards, voice of Mississippi “good ol’ boy” Junior Ray Loveblood. Read the full review at the Publishers Weekly website. Zellner’s memoir focuses on his experiences as a civil rights activist from 1960 to 1967. He tells a story that is sometimes horrific, always interesting, and ultimately inspirational about a white Southerner’s commitment to racial justice. Read the full review at the Library Journal website. The Yazoo Blues and The Wrong Side of Murder Creek are both available at their respective links, or from your favorite local or online book retailer. NewSouth editor-in-chief Randall Williams speaks with host Lori Cummings on Alabama Public Television’s Face to Face show on Sunday, August 24. The show will air at 2 pm and 11 pm. In the conversation, Randall and Lori talk about the nature of independent publishing, and about NewSouth’s mission in publishing books that inform our audience about the Southern region. Lori asks about the publishing process from an author’s point of view, and Randall gives tips about how an author can prepare their manuscript for submission. Learn more about Face to Face at the show’s website. The 16th Annual Poets House Showcase recently featured all of the new poetry books published in the United States this year, including books by NewSouth authors. More than 2,000 titles were on display from April 12-19 at the historic Jefferson Market Library. According to Poets House website, “The Showcase provides writers, readers, and publishers with a fascinating vantage point from which to assess publishing and design trends and linguistic, aesthetic, and philosophical shifts … the Showcase reflects Poets House’s mission to make the range of modern poetry available to the public and to stimulate public dialogue on issues of poetry and culture.” All the poetry book titles can be found in the fully-searchable online Directory of American Poetry Books featuring over 20,000 poetry titles published between 1990 and 2006. The World According to Whiskey: Tom House’s poems are tough and graphic, and they bear witness to the underbelly of a Southern culture with no room for the disenfranchised—the poor, the weird, and the broke. And All the Layered Light: Using the settings and imagery of his native rural Kentucky, Charles Semones creates a collection of poems that transcend time and place. It’s Southern Gothic writing at its finest. Century of the Death of the Rose: The works of the late Ecuadorian poet Jorge Carrera Andrade are presented in English and the original Spanish in this volume of his poetry, selected and translated by Steven Ford Brown. 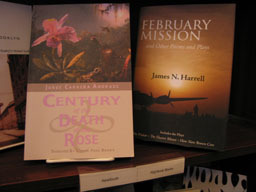 February Mission: Jim Harrell’s volume of poetry and plays ranges back in time over his own rich history, visiting places he’s been and wars he’s experienced, friendships shared and loves lost, and life on the littoral coast, which inspires much of his work and describes his emotional home. Straying Toward Home: The poems, like the title of this book, are delicious paradoxes. James Mersmann’s vivid images and beneficent intelligence are a continuous pleasure. It’s Good Weather for Fudge: Conversing with Carson McCullers: Sue Walker imagines a friendship and conversation with McCullers as they share memories of two women growing up in the Deep South, McCullers in Georgia and Walker in Alabama. One More River to Cross: The late John Beecher’s powerful, spare verse is brought together in this collection, compiled and edited by Steven Ford Brown. To learn more or to search the Directory of American Poetry Books, check out the Poets House website. Find all the above titles and more at NewSouth Books, Amazon. com, or your favorite local or online retailer. Senator Barack Obama’s speech Tuesday in Philadelphia has been widely quoted and discussed. Historian John Hope Franklin called it one of the most candid and significant public statements on race in American political history. NewSouth Books—which publishes widely on civil rights and racial and political issues—agrees and has formatted Obama’s complete text (which was released to the news media) into an easy to download and print ebook package. It is available for free download here. The house is doing well in a time when people are reading less for leisure, and major publishing houses are only interested in tried-and-true mega-selling scribes, such as Danielle Steele, John Grisham, J.K. Rowling or the newest wunderkind like Myla Goldberg. Publishers Weekly‘s Nawotka also praises NewSouth’s eclectic collection of titles. Most contain civil-rights or cultural-awareness angles, but they take very different forms. A NewSouth book that beautifully fits that bill is the Jewish-themed children’s book Shlemiel Crooks, written by Anna Olswanger and illustrated by Paula Goodman Koz. A clever twist on the Passover tale, Crooks was inspired by a 1919 newspaper article from The St. Louis Jewish Record, and uncovers St. Louis’ Jewish community in the early 1900s. NewSouth also isn’t afraid to create political waves. “I’ve known Randall Williams for a great many years, and when I decided to write that book — more or less in the heat of passion — I called Randall because he was the only publisher I knew who could possibly turn something around as quickly as that,” said Egerton, uncle of Courier-Journal theater critic Judith Egerton. Read the full article from The Courier-Journal. The full line of NewSouth Books titles are available from your favorite local book retailer, online, or at www.newsouthbooks.com. NewSouth authors Charlotte Miller and Billie Jean Young have both contributed to a new anthology, An Alabama Christmas, from Cliff Road Books. Miller’s story, also called “An Alabama Christmas,” is the story of a young girl’s Christmas in the Depression-era South, and her father’s struggle to make her Christmas dreams come true. Young’s story is entitled “Fireplace Dolls.” Learn more about the anthology at the Cliff Road Books website, www.cliffroadbooks.com. Charlotte Miller is the author of Behold, This Dreamer, There is a River, and Through a Glass, Darkly from NewSouth Books. Billie Jean Young is the author of Fear Not the Fall from NewSouth Books. All of these titles are available from your favorite local or online retailer, or at the links above. NewSouth Books is pleased to offer extended search capabilities for our books, using new Google Book Search tools. Readers can now search the full text of NewSouth Books, view pages and photographs from the books online, and even see reviews and references to NewSouth Books from across the web. Select NewSouth book pages feature Google Book search boxes, including the new edition of Alabama storyteller Kathryn Tucker Windham’s Alabama, One Big Front Porch; Bill Elder’s memoir of desegregating college athletics, All Guts and No Glory, and Gerald Duff’s new collection of award-winning short stories, Fire Ants. To search the text of all our NewSouth titles, visit our Titles in Print page. NewSouth Books titles are available from your favorite local or online book retailer, or from www.newsouthbooks.com. You are currently browsing the archives for the NewSouth Books News category.